At 4 months, I can’t believe how much my little girl is changing. It seems so long ago when we put her tiny little self into the cot, as she slept peacefully, with two tired eyes staring down at her. Only those few months ago, she depended on us so much, for milk, to clothe, bathe and change her, it’s really so amazing, that now 4 months on she’s trying solids, enjoying each bite and likes to help feed herself. She’s just growing up so quickly, and I can’t quite believe it! If you’re a mum-to-be, believe it when we all say, it goes so quickly. I met my friend Clare and her daughter Scarlet who is 7 weeks younger than Emily and try to remember why Emily was like then! It’s mad. Times change and there’s still so much more to come. The first year really is amazing and so far Sam and I are only 4 months into Emily’s incredible journey. Each and every feed, Emily loves being part of her feeding experience. She likes to hold the bottle or if I’m feeding her one of her fruit puree’s or veggie mixes with baby rice, she’ll happily try and shove her spoon into her squidgy little face. It’s funny to see how she’s not really got the spoon-to-mouth coordination yet, only everywhere but her mouth. It’s definitely very messy but actually really quite fun. At this moment in time, most days Emily will have porridge at some point in the morning for breakfast, some type of fruit puree after each bottle feed and a vegetable mixed with her baby rice in the evening. 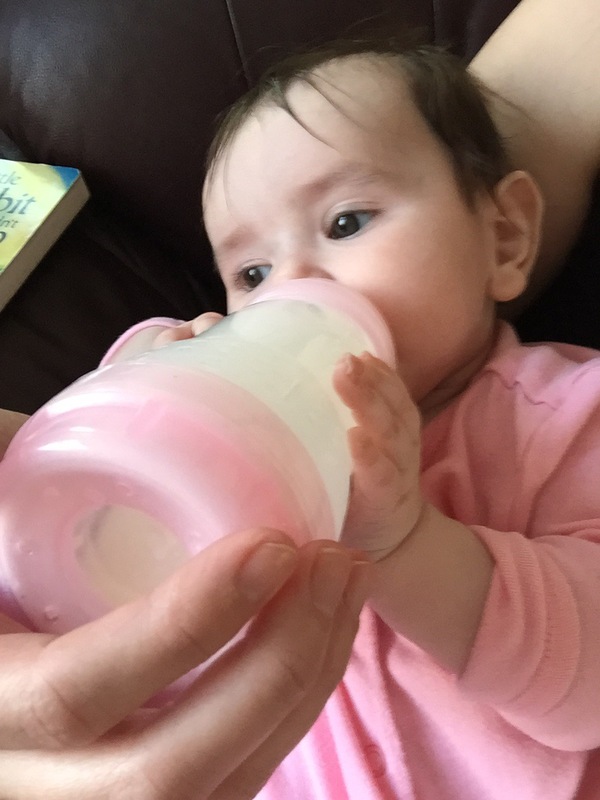 With her healthy appetite, she doesn’t drink as much formula per feed as she used to, but sometimes she’ll refuse food altogether and only stick to the formula. I’m looking forward to the next weaning milestone when she can try more than just veggies and have different meals mashed together and some chunkier foods too. Exciting times! Previous Post Mummy’s, the second lot of injections aren’t that bad!